One of the things that I think can turn women away from working in manufacturing or engineering can be that you cannot wear a cute outfit and still be safe on a manufacturing floor. The experience of working on a manufacturing floor is awesome, challenging and really worthwhile for your education and your career. In a way, manufacturing does limit some of what you can wear or do. I cannot wear a skirt or heels on the floor but there are plenty of ways to spruce up safety wear and floor wear and still be absolutely adorable. PPE is Personal Protective Equipment. For most manufacturing places, this means steel toes, safety glasses and ear plugs. In the picture above, I am cheesing but this was a typical day's PPE for me. The hair net is crucial for food because who would want a hair or something in their lovely dinner? I was kind of horrified at first and took about 50 snapchats to show my friends that this was crazy. After a while, it was great though! I did not really have to worry about ruining my nice shoes or doing my hair really well for the summer.One way that I really got used to wearing the PPE and almost went to enjoying it at the end was the quality that my company had gotten for me. Buying or receiving good quality and slightly personalized PPE can make your day a whole lot better! I have a ton of good PPE from various jobs and Amazon (life saver for colored gear). I have pink safety glasses or these nice almost real glasses like safety glasses. They are more comfortable than the ones you would wear for chemistry lab. I also have steel toe sketchers and the ankle high steel boots that men wear. Unless specifically called for in an email or manual, I usually just wear the sneakers. They are super comfortable and they look a little more sleek. Lastly, ear plugs are so fun and I love all the colors that they come in today. I love the foam disposable ones but if you have or buy the giant headphones (like air traffic controller kind) - you can spray paint them. For me, in both my internships that involved manufacturing, I wore a lot of pants. I did try to make wearing pants fun! This summer, I had about 6 pairs of skinny khakis in blue, green, grey and tan that I bought from the GAP that I rotated. I got them during a 40% off sale and they held up very well. Another option is the bootcut kind of khakis - I like these for days when am in and out of the floor alot. Usually, I wear flats off the floor and sneak in and out without anyone telling that I do not have on steel toes with the bootcut pants. Whatever you choose, make sure it fits well and you will be super happy! Most of the time, I liked to wear a company t-shirt or a polo to work. Old Navy has great polos for work and they wash great. I usually buy the tall size so that they can be tucked into my pants easily as well as cover my back when I bend over to pick things up. I got machine oil all over one of my Old Navy polos and it came out without a stain. I cannot say the same for the nice polos I got other stores that have like dryfit type material. Walmart is also a great option for work shirts and polos that you do not feel bad throwing out if the job really messes them up! I would wear some eye makeup behind my glasses when I had big meetings or things of that nature. One of the things I loved about working on the floor is that I did not need a ton of makeup because everyone was gross or in the process of getting gross from either sweat, cleaning or machine crud. I did miss painting my nails - a no no in the food industry - but I compensated by painting my toenails a fun color every week. The trade off of working on the floor and being hands on is worth not doing some of my favorite things all of the time. Overall, I would really consider careers in manufacturing on the floor. They are great learning experiences and gain people, especially women, a lot of respect with the team and management. Knowing how a product is made and what it takes to do it on a hands on real time level is invaluable! 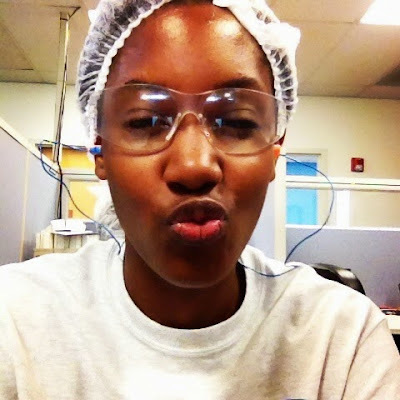 My name is Taylor Lacey and I am an engineer by trade but an advocate of STEM by choice. This blog chronicles my life as influenced by my engineering brain.